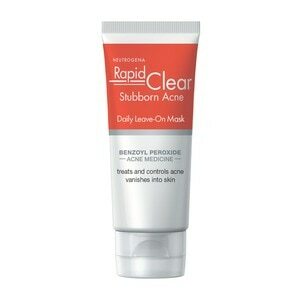 Use Neutrogena Rapid CLEAR Stubborn Acne Daily Leave-on Face Mask to reveal clearer skin. This leave-on mask is clinically proven to reduce the size and redness of current breakouts in just four hours. The gel formula, with benzoyl peroxide acne medicine, vanishes instantly into skin, allowing the acne medicine to absorb deep down, killing acne-causing bacteria to fight both your current stubborn acne and the acne forming under the surface of your skin. Unlike traditional face masks, this is not a wash-off product. When used morning and evening, this dermatologist-recommended benzoyl peroxide acne medicine allows you to treat acne around the clock so you can keep fighting acne all day for results that last. Safe and gentle enough for daily morning and night use, it won't over-dry, sting, or burn skin and dries clear, so you can use it under your moisturizer or makeup. For external use only. When using this product. Skin irritation and dryness is more likely to occur if you use another topical acne medication at the same time. If irritation occurs, only use one topical acne medication at a time. Do not use if you. Have very sensitive skin. Are sensitive to benzoyl peroxide. When using this product. Avoid unnecessary sun exposure and use a sunscreen. Avoid contact with the eyes, lips and mouth. Avoid contact with hair or dyed fabrics, which may be bleached by this product. Skin irritation may occur, characterized by redness, burning, itching, peeling, or possibly swelling. Irritation may be reduced by using the product less frequently or in a lower concentration. Stop use and ask a doctor if. Irritation becomes severe. Keep out of reach of children. If swallowed, get medical help or contact a Poison Control Center right away.